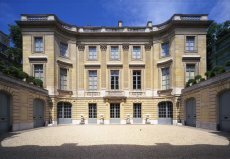 The Nissim de Camondo museum is a magnificent mansion built and furnished with some of the most lavish furniture, artwork, tapestries, china and silverware from the 19th and early 20th century. The Story of the Camondo family is fascinating but tragic. Moses Camondo, a very wealthy Parisian banker, was a passionate collector of French furniture and art from the eighteenth century and over the years he amassed a collection of unusual quality. In 1911, he hired architect Rene Sergent to build a private mansion next to Parc Monceau that would be worthy of this collection and suitable for his family. The design was modeled after the Petit Trianon in Versailles. The home, which is fully preserved in its original condition, offers an opportunity to discover the taste of a great collector and to get a glimpse of the everyday life of an aristocratic home. Moses Camondo planned to leave his home and collections to his only son Nissim. Unfortunately, Nissim was killed during World War I. In memory of his beloved son Moses Camondo left his property to the "Arts Décoratifs". The Nissim Camondo museum opened the year after Moses's death in 1935. The death of Moses's daughter, her husband and children in Auschwitz during the Holocaust terminated the Camondo dynasty.